Pearce MHR Christian Porter breaks the ground for stage two at Northshore Christian Grammar School. NORTHSHORE Christian Grammar School held a groundbreaking ceremony for construction of the second stage of its Alkimos campus this term. Principal Stuart Chisholm said the school community was excited about continuing investment in the school, which opened with 52 students from Kindergarten to Year 6 in 2017. “Our students’ future is the core of our purpose and providing them with state-of-the-art facilities and passionate teachers is our top priority,” he said. Last year the middle school opened and the school will grow year on year until it caters for Kindergarten to Year 12 in 2023. Stage two is set to open in January 2020, and it was designed to cater for students in Years 7 to 12. Between the two buildings, there will be an undercover multi-purpose sports centre which can be used as a basketball or tennis court. 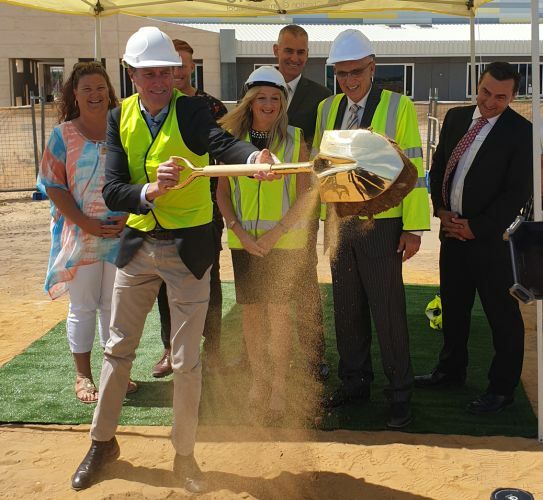 The ground-breaking ceremony on March 20 included addresses from Swan Christian Education Association chief executive Neil David, Pearce MHR Christian Porter, Butler MLA John Quigley and Wanneroo Mayor Tracey Roberts. Mr Porter said the Federal Government provided $1.4 million for the school to expand its campus – it provided $1.6 million in 2017 as well. Enrolments for years 7, 8 and 9 in 2020 are open – visitwww.northshore.wa.edu.au for more information.